So, we had a baking day this week at our house. I remember reading in as a girl Little House On The Prairie about how “Ma” had a baking day, wash day, etc. I imagine that Maggie had a similar routine. Perhaps one of my aunts or their cousins would know. But, this week we made bread, rolls and granola. 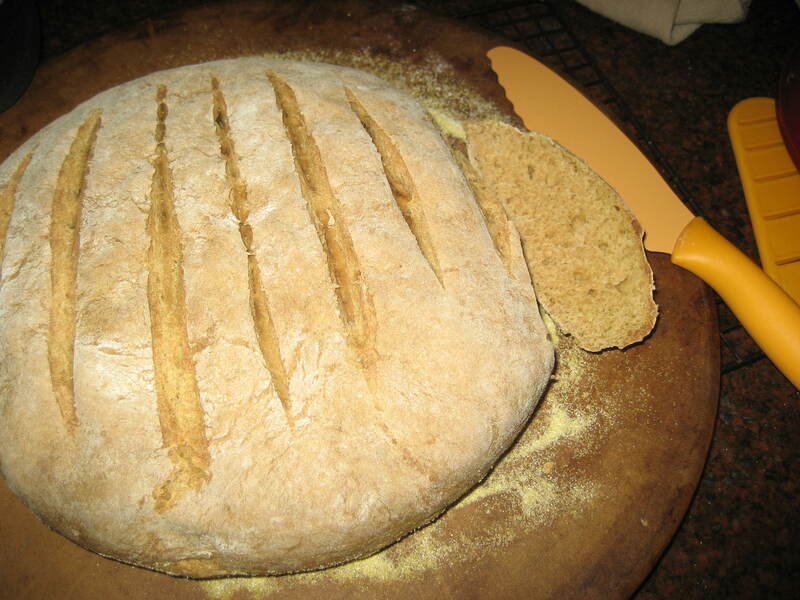 Though not my prettiest loaf – it tastes really good. Before and after our first child was born I made almost all of our bread from scratch. 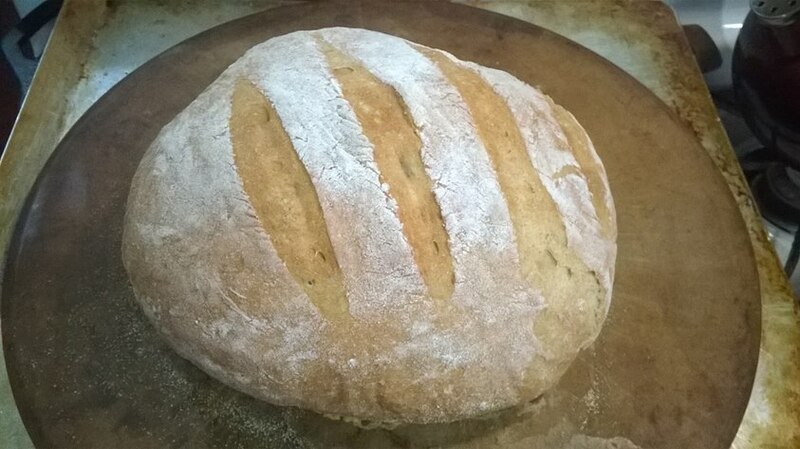 I used King Arthur Whole Wheat Flour and would knead it and let it rise, punch it down, knead it again and let it rise, and then give it a final rise in the bread pan. As you can imagine, this process took all day. And when our son came along 11 months after our daughter was born, somehow I couldn’t find the time to fit in all the rising and kneading amongst nursing, changing diapers and napping. 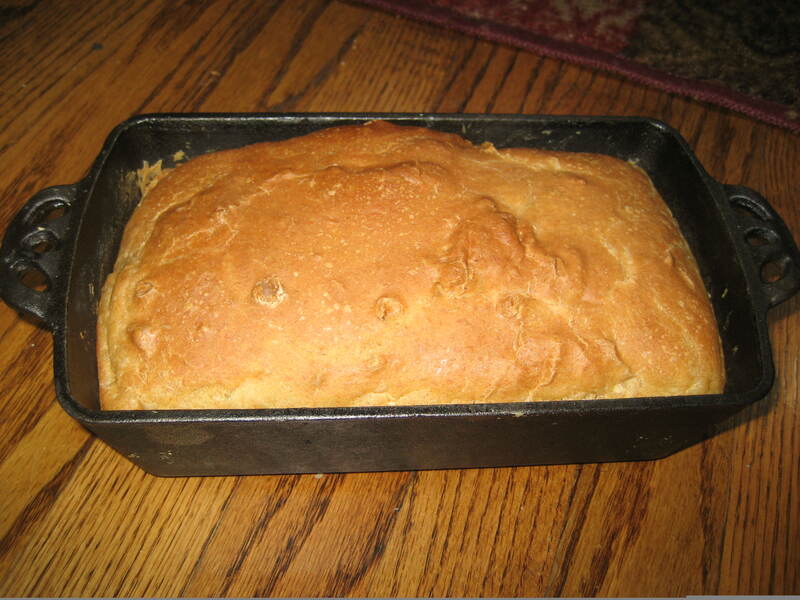 So our homemade bread fell by the wayside until my mom shared a book review with me and bread making was doable again. 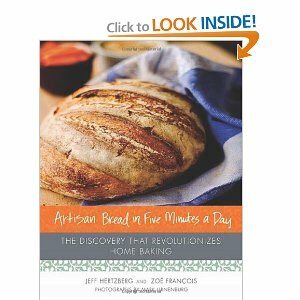 A rtisan Bread in Five Minutes a Day makes breadmaking easy. And it’s true to it’s word. You can really make traditional homemade bread in the time that it takes to stir the ingredients in the bowl. It works on a similar principle as a sourdough starter would, though with much more ease. Basically you make a large amount of dough that is wetter than typical bread dough, let it rise, refridgerate overnight (optional but better). Then the following day you remove the amount you want to cook. Let it rise. And bake it. It’s simple and ready to go. You can keep the dough in the fridge in a loosely lidded container for up to a week. Just remove the amount you need and you can have fresh bread every day if you want to. I’ll also take this opportunity to put in a plug for my favorite cookware – cast iron. My mother has some of my grandmother’s and Maggie’s cast iron pans and skillets and they have only improved with age. Beware though, if you begin to use cast iron “it’s addictive” as my friend told me this week. And she’s right. Once you begin to use it you’ll never want to go back. It’s the perfect non-stick cookware. And I find it much easier to clean than conventional pans and skillets, espescially if you use a Nylon Pan Scraper and hot water (no soap). And when seasoned and cleaned correctly, cast iron only gets better with use and age – and it will last forever. You’ll never have to buy new pans again. So, my last batch of bread was cooked in this Cast Iron Bread Pan and my rolls in the Lodge Logic Pre-Seasoned Drop Biscuit Pan . They came out perfectly browned, and slid right out. Try some cast iron and let me know what you think. It’s healthy too. A little bit of the iron from the cookware leaches into your food when cooking to give your meal a boost of iron. Could it get any better than that? Happy baking. Affiliate links contained on this page. Full Disclosure here.